After Han Solo somehow ended up living on the streets all alone, he took to living in a residential area near some very busy roads, just trying to find a quiet place to hide where no one would bother him. Some residents of the neighborhood noticed the little dog darting around and were worried he might get hit by a car, so they called Hope for Paws for help. Rescuers Lisa Arturo and JoAnn Wiltz got the call, and drove out to the neighborhood where Solo had been spotted. 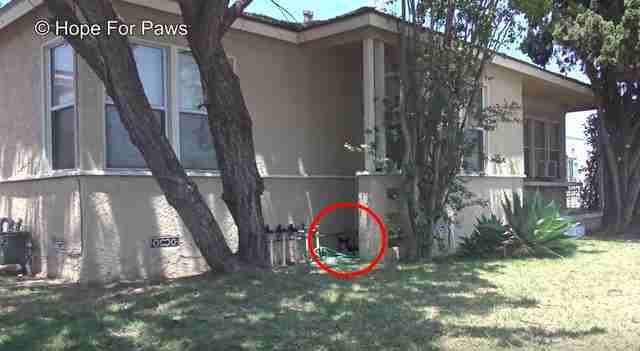 When they arrived, they found him huddled up in a resident’s yard, and quickly fenced in the area so that he wouldn’t be able to run away. … even once they were sitting right next to him. The two women talked quietly to Solo, trying to gain his trust and assure him that they weren’t there to hurt him. They showed him the leash they wanted to put around him, and let him get used to it for a little while — before gently slipping it around his neck. Even once the leash was around his neck, all Solo could do was stare at his rescuers, as he was still so scared that they were there to hurt him. 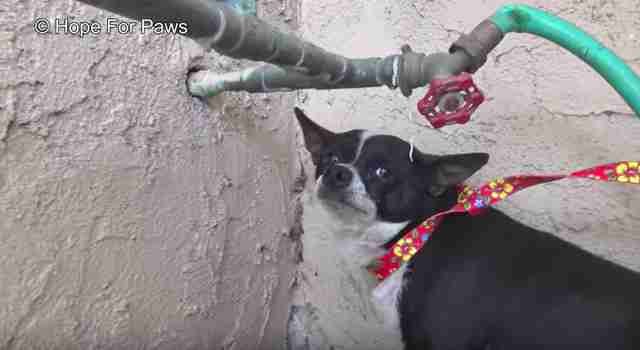 After living on the streets for so long, the little dog was clearly very untrusting of humans, and his rescuers hoped that would change with time. 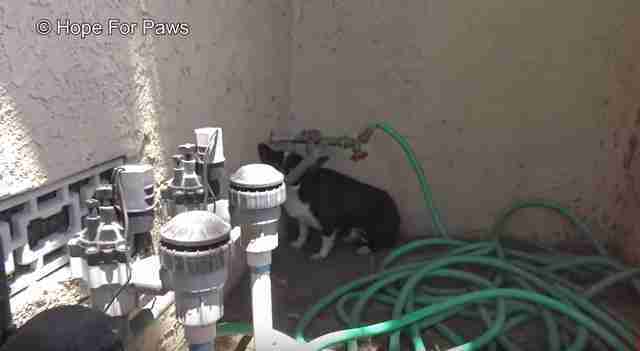 “He was stressed and didn’t know we were there to help him,” Eldad Hagar, founder of Hope for Paws, wrote in a video about the rescue. Arturo grabbed a soft blanket and began gently petting Solo with it, hoping that would help to calm him down a little bit. After a while, she slowly placed the blanket around Solo, and used it to carefully lift him up out of the corner. Once he was safely in her arms, he seemed to relax ever so slightly, and she carried him back to the car. Solo’s rescuers took him to the vet to get him checked out right away. Once there, he still seemed confused and a little overwhelmed, but he wasn’t as scared anymore, and slowly began to warm up to his rescuers and everyone around him. He had a nice warm bath, and seemed to start to understand that he was finally safe. The rescuers scanned Solo for a microchip and found none, so he was taken in by PAL Rescue and placed with a foster family. 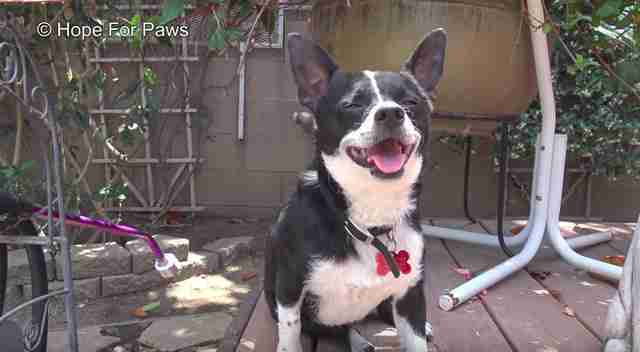 Once he was settled into his foster home, Solo’s true personality began to shine through, and he suddenly became the sweetest, friendliest little dog. He now loves people and isn’t afraid of them anymore. He loves spending time with all the new people in his life, and everyone is confident that he’ll find his forever family very soon. If you’re interested in adopting Solo, you can contact PAL Rescue for more information.